Followers of this strange blog will know that I am into geocaching in my spare time. Just recently I came across the tech version, Munzees. Geocaching involves finding a container (cache) containing a log book and maybe other goodies, using GPS on a dedicated gadget or a smartphone app. 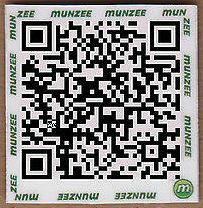 Munzees are actually QR codes, normally on stickers but also on tags similar to geocaching travel bugs. They are also found with GPS using a dedicated smartphone app that you can download from your usual app store and use for free, or from www.munzee.com. Munzees will never replace geocaches – it’s a bit like comparing pitch and putt to golf – but they have advantages. They are very cheap at £0.25 per QR sticker (less than €0.35) and they are unlikely to get broken, stolen or suffer from wet log books. So no maintenance! They can be captured quickly and easily once found, so are great if you have a few minutes to spare when visiting a town. The downsides are that the app is a little flaky and not well documented but there is a forum which you can find using Google. Also some have been placed in the most unimaginative places; the first few I found were on lamp posts in a London Underground car park – exciting eh? In Lagos (Algarve) they are catching on and several have been placed (by me) to provide a tour of the town’s street art. Other munzee-ers have deployed them to show you interesting statues and unusual roundabouts and to lead you to some of the best bars and restaurants in town. We are also placing them where there are great views, historic buildings and, if things go to plan, inside a geocache. If you have any problems with the munzee app I may be able to help if you send me a message or email me. However, I’m very new to this too, so I’m not the oracle. This entry was posted in Home and tagged algarve, Chip the Duck, geocaching, Lagos, munzee, munzees. Bookmark the permalink.